Our shower filter effectively removes chlorine and other contaminants including iron, arsenic, mercury and hydrogen sulphide leaving your shower water clean and fresh. The Shower Filter uses a patented filtering media called KDF 55. Its long life performance is a breakthrough in shower water treatment technology. We recommend that shower filters be changed only once a year. You will be notified by a member of our staff when we believe you should change the filter. 1. How does the Shower Filter work? 2. What will the Shower Filter remove? 3. How long will the Shower Filter last? 4. What is the minimum and maximum temperature required? 5. What is the maximum water pressure? 6. How is the Shower Filter installed? 7. What is the difference between the SH-HI and SH-LO? The Shower Filter utilises a patented filtering media called KDF 55, this media consist of finely granulated Copper and Zinc alloys and will effectively remove chlorine and other contaminants such as bacteria. The incorporation of a stainless steel mesh strainer means the added filtration of dirt and sediments. The incorporation of the special KDF 55 media within the Shower Filter means it is able to remove contaminants such as Chlorine, Iron, Arsenic, Mercury, Hydrogen Sulphide, Algae, Fungi and dirt and sediments contained in the water. 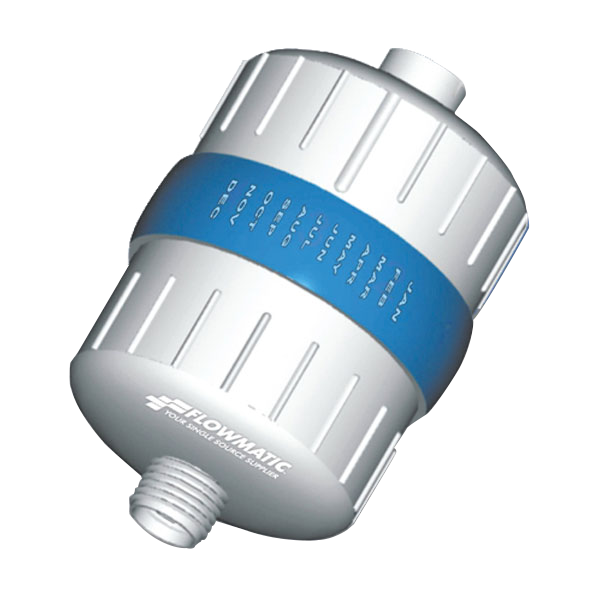 The Shower Filter has 10 to 20 times the life and effectiveness of any carbon only filter. The life expectancy of the filter is approximately 15,000 litres, this would be between 12 to 18 months depending on the water quality. The Shower Filter is installed directly on to your existing shower head. Once the exisiting shower head has been removed, the Shower Filter should then be attached to an extension elbow (this should be available at any good plumbing merchants or bathroom centres. The Shower Filter will then be connected to the shower body, following this the shower hose and head can then be installed to the Shower Filter. Water should be allowed to run through the filter for one minute before first use. 7. What is the difference between the SH-LO and SH-HI? The SH-LO and SH-HI Shower Filters both use the same body housing. The distinction between the two units is the media. The SH-LO utilises the KDF 55 media in a filament form, this allows the filter to dechlorinate at a much lower water pressure. As the SH-HI is designed for use on showers on direct mains pressure, the SH-HI utilises a more dense granular form of the KDF 55 media. Each shower filter lasts roughly a year before needing replacing. Use fewer nasty chemicals in the shower. Fits in neatly and discreetly with your shower.